Advance Iron Works has a proven record of excellence in fabrication of structural steel, architectural steel, stainless steel, component steel, aluminum, bronze, and other alloys. 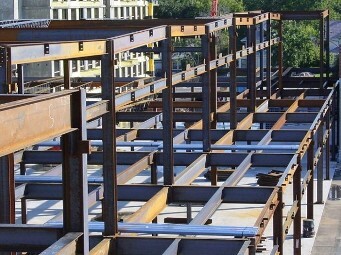 The experienced professionals at Advance Iron Works provide comprehensive steel services; preparation of detailed drawings, material procurement, quality fabrication, application of sophisticated coating systems, steel erecting and installation. We have expertise in completing the most difficult and demanding projects. Customers can opt for any, or all of our services, depending on project requirements. Effective, timely planning is crucial to the successful completion of any project. Our team of experts will first assess your goals then provide an efficient project plan that meets or exceeds industry standards and project requirements. Advance Iron Works has been successfully delivering exceptional work for over 50 years. Our company is Quality Certified by the American Institute of Steel Construction (AISC) for Steel Building Structures, Simple Steel Bridges, Fracture Critical Endorsement and Sophisticated Paint Coatings Endorsement - Covered. Advance Iron Works can execute any steel or metal project; buildings, bridges, ornamental steel, steel components for your equipment, parts for your facility or custom products, including those with single or multi-coat painting systems - call us to have your project estimated and underway.